When the Teaching and Research Assistants at Concordia signed their latest collective agreement in December, the union thought that it had achieved a great success—one that was almost two years in the making. However, this accomplishment is being overshadowed by the knowledge that Concordia is in the midst of drastically reducing the budgets for teaching assistants and research assistants at the John Molson School of Business. 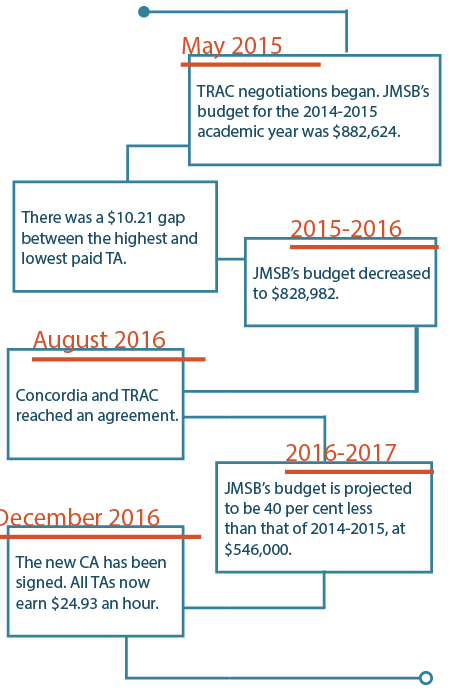 The projected budget for TAs and RAs at JMSB is $546,000 for the 2016-2017 academic year. This is a decrease of almost 40 per cent from the 2014-2015 academic year, when the budget was $882,624. The result: TA’s at JMSB are working significantly fewer hours this year than they have been in the past. TRAC learned these figures after a meeting with The Link last week. He explained that the significant cuts were announced to JMSB professors and lecturers in a meeting just over a year ago. The decision to slash the budget was not motivated by the new collective agreement, simply because it was not yet on the table at that point. “Some of our members were acting as lecturers in that faculty, so they were all in that meeting,” Jafari Nodoushan said. In an email, Mota explained that these budgetary decisions are under the scope of each faculty and, as a result, they will each deal with these cuts in different ways. She was unable to confirm the status of the TA and RA budgets for the Arts and Science, Engineering and Computer Science, and Fine Arts faculties. Gounash Pirniya, TRAC’s Labour Relation and Grievance Officer, echoed this concern. She explained that throughout the negotiations, which lasted from May 2015 until August 2016, Shepard repeatedly put emphasis on maintaining a high quality of education. TAs, she said, are crucial in preserving that quality. That is why TRAC considers the new collective agreement to be a success. They explained that, from what they understood, the agreement ensures that more money will be going to TAs, enabling them to uphold a high quality of work. “If you are not going to increase that budget, it means that you do not care about that quality of education,” – Gounash Pirniya, TRAC’s Labour Relation and Grievance Officer. This is most prominent in their new pay scales, which Pirniya said eliminate disparities amongst their members. She and Jafari Nodoushan explained that their goal going into these talks was to secure equal pay for equal work. While negotiating with the university, they were able to eliminate the confusing classifications which resulted in members being paid up to $10.21 less per hour for similar workloads. “Before reaching this agreement, the most number of grievances were related to the misclassification in faculties [other than engineering],” said Pirniya. Slight variations in duties, such as not holding office hours, would shift teaching assistants from being categorized as Grade 1 to Grade 2, resulting in the pay gap, she explained. Now, TA’s across all faculties are being paid $24.93 an hour, while markers—whose job consists solely of marking assignments with no direct contact with students—are paid $20.21 an hour. This is true regardless of the TA’s level of education, whether they are undergraduate, Master’s, or PhD students. This agreement, however, is limited. It’s retroactive—meaning TAs who worked during the summer and fall 2016 semester will be receiving the difference between the new and old pay rates—and will only be in place for the next year. In due time, TRAC will be back at the bargaining table and the battle that they’ll be fighting will be on uneven grounds. One of the biggest questions they have on their mind going forward is whether or not Concordia will be increasing the overall budget for TA’s. As the current agreement has not yet been published—TRAC themselves have yet to receive a copy—the details, such as the promise for an increased overall TA budget, cannot be verified. This part of the agreement, Pirniya explained, was clearly laid out from the start. With each proposal, she said that TRAC included how much they expected the total budget for TAs at Concordia to increase—and that the negotiators on the other side understood that. She explained that the retroactive payments—which she said have been as high as $2,000 for some members—are a sign that they are moving in the right direction. If TAs are receiving payments, she said, then it means that more money had to come from somewhere.